Hawthorne, CA – Space Exploration Technologies (SpaceX) announces that its Merlin 1D engine has achieved a full mission duration firing and multiple restarts at target thrust and specific impulse (Isp). The engine firing was for 185 seconds with 147,000 pounds of thrust, the full duration and power required for a Falcon 9 rocket launch. The tests took place at SpaceX's rocket development facility in McGregor, Texas. The Merlin 1D builds on the proven technology of the Merlin engines used on the first three flights of Falcon 9, including the recent historic mission to the International Space Station. With nine Merlins on the first stage, the Falcon 9 rocket will produce nearly 1.5 million pounds of thrust in a vacuum. An enhanced design makes the Merlin 1D the most efficient booster engine ever built, with a vacuum thrust-to-weight ratio exceeding 150, while still maintaining the structural and thermal safety margins needed to carry astronauts. Additionally, as SpaceX continues to fulfill an extensive manifest of launches, the new engine is designed for improved manufacturability by using higher efficiency processes, increased robotic construction and reduced parts count. 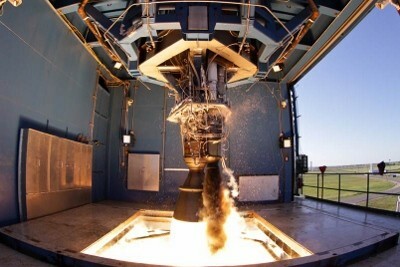 The Merlin 1D engines will first see flight on Falcon 9 Flight 6, expected to launch in 2013.